Startwithsilver is 2-for-2 since trainer Linda Rice moved her off the turf to start her 2018 campaign. The 5-year-old daughter of Jump Start won an optional claimer by 2 ¾-lengths on January 25 in her first appearance on the main track since June 2016. Owned by Iris Smith Stable, Lady Sheila Stable and Rice, Startwithsilver rallied from last in a six-horse field to win the Broadway by six lengths over Bee Noteworthy last out on February 18 at the Big A. That effort, contested at the Correction distance of six furlongs, earned the gray mare a personal-best 96 Beyer Speed Figure. Jockey Junior Alvarado, who was aboard for the previous two wins, will have the return call on the 5-2 favorite from post 6. 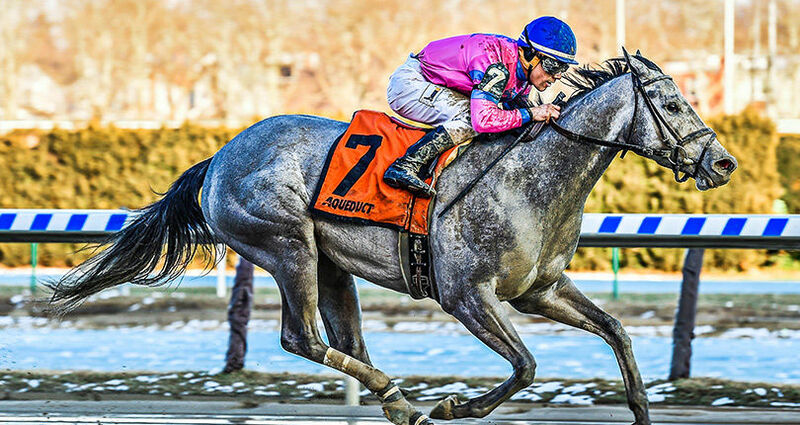 Startwithsilver’s stablemate Sounds Delicious will make her stakes debut after starting her career 4-1-0, including a 6 ¼-length score in an optional claimer on March 4. Angel Arroyo will ride from post 3. Marc Keller’s Quezon will challenge Startwithsilver for supremacy and enters the weekend with back-to-back stakes wins, capturing the Garland of Roses and La Verdad with both wins coming on Aqueduct’s main track. The 6-year-old Tiz Wonderful mare, trained by Robert Ribaudo, has finished on the board in her last six starts, including a runner-up effort in the Iroquois on October 21 and a third-place finish in the Grade 2 Gallant Bloom on September 24 at Belmont Park. Joseph Rocco, Jr. will be in the irons on the 7-2 choice from post 5. Spice Lady won two of her first three starts for trainer Todd Pletcher before seeing her first stakes action in the Grade 3 Hurricane Bertie, where she held the lead at the half-mile mark before tiring and finishing seventh on January 27 at Gulfstream Park. The 4-year-old Speightstown filly, at 6-1, will make her first start at Aqueduct breaking from post 4. Trevor McCarthy will ride. Rounding out the field is Nisha, who drew the rail for trainer Jeremiah Englehart, My Miss Chiff, trained by Al Stall, from post 7; Summer Reading, for trainer Jimmy Jerkens, exiting post 8; Anydayismyday, for trainer Edmund Pringle, will leave from post 2; the Tom Morley-trained Bluegrass Flag, from post 9; and Rowd E Allie, trained by Ronald Rideout, in breaking from the outside post.